I recall that I flew kites as a kid just like almost everyone else did. I have no major memories of that childhood kiteflying, and I guess that it was just typical “kid stuff” at the time! Many of you know how that story goes, you buy a paper Hi Flier diamond for a quarter, fly it till you break it, or lose it, then move on to softball, roller skating or girls! (guys) In the very beginning kiteflying was just a Spring Thing and not much more then an interesting and fleeting diversion of childhood. In 1974 I was introduced to an entirely different kind of kiteflying by a friend from California visiting me in Chicago. While our wives shopped and gossiped Charlie Moore suggested that we go to the local baseball field and ‘Fly a Kite’ I thought that this was a sort of childish idea, but Charlie was visiting company, and I agreed. Rather then going to the local dime store and getting one of those paper kids kites Charlie suggested that we go to the hardware store and buy the stuff to make a couple of kites of your own! I thought this was a pretty unusual idea and was more then a little curious so off we went to build Al’s first real kite. Charlie Moore and I built three kites that day out of black garbage bags and wooden dowel rods. The Box Kite and the Delta we built didn’t fly very well. BUT the Sled kite did fly, much to my amazement, as I had never seen a kite like this one before. After the Sled kite was in the air, Charlie and I sat around, drank some wine we had brought with and just talked! Charlie was a typical laid back California guy and I had a great time just sitting around talking to Charlie! I asked a lot of questions about how Charlie knew how to make these kites, and where he got the ideas and plans. We talked about aerodynamics, lift and drag and all those technical kite things all kitefliers discuss out on the flying fields! Charlie spent quite a lot of time talking about why everyone should fly a kite! He talked about being a part of a kite club, and about kite festivals he had been to, about the sense of accomplishment you get from building a your own kite that flies, and about the beauty and the wonder of something that flies high in the sky! BUT Charlie also spent quite a lot of our time together talking about the people that fly kites, and the people you meet out on the kite fields. He mentioned our own flying that afternoon as a good example. That Sled kite was flying, without much attention or help from the either of us! That simple homemade kite was giving us a reason to be visiting and talking together! I had to agree that we were having a good time, just hanging out together, sitting and talking, all centered on the end of that kite string! This first “serious” piece of Al’s kiteflying history s documented in my first Kitelife article six years ago. I still have that “First Real Kite” in my kite bag after thirty-one years! In 1979 I learned about the American Kitefliers Association and immediately joined the Club. I thought that the newsletter The AKA News was worth the price of admission filled with kite plans, and festival reports and more importantly all the stuff about kitefliers all across the country! I read with great interest about Jack Van Gilder and his delta kite trains, and Dave Checkley’s trips to Japan and China. About Bevan Brown and his Carousel and eagle kite! All about kite clubs across the USA, and all the very interesting people who were avid kitefliers, and members of the AKA. In 1980 I read an advertisement in the AKA News from kitefliers Lee and Anita Hoover. They said they were interested in starting a kite club in Chicago. 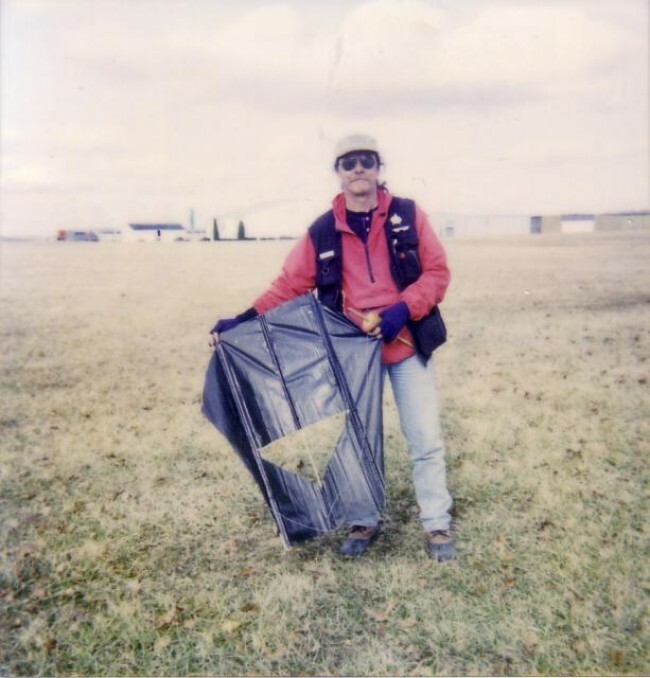 I contacted Lee and Anita right away, and after a while we formed the Chicagoland Sky Liners Kite Club! AND I now could fly with many other kitefliers right in my home town! I met literally hundreds of incredibly interesting and talented kitefliers. Fliers like Charlie Sotich, Elmer Wharton, Eric and Dorothy Wolff, John Karoll, and Jim Miller, just to name of few! In 1982 I decided I wanted to put faces to all the famous kiteflier names I had read about in the AKA News, so I attended my first AKA National Convention in Detroit Michigan! I was really amazed and enticed at that first convention. There were literally hundreds of kites flying that I hadn’t even imagined existed. AND the people! Red Braswell, Margo Brown. Hank and Nancy Zerlag, Rick Kinard, Brooks Leffler. Each and every one of those “famous” kitefliers I had read about were even more interesting in person. I came away from that first AKA Convention with many new friendships and more then a few new kite ideas bouncing around in my head! Throughout the many years I’ve visited kite fields I’ve found that the kitefliers I meet are some of the most interesting and diverse people I know. I’ve met artists, and poets, mailmen and gourmet chefs, rocket scientists and vagabonds. Each tied together in some way or another with that simple bond of kite string. Many people I meet out on today’s kite fields ask me, “How have you stayed interested in kiteflying for so long?” I suppose my first answer is usually, because of all those wonderful and interesting people involved in the hobby and the sport of kiteflying! 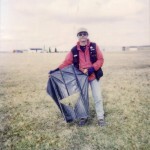 I’ve seen quite a lot of people come and go over the last 31 years of my kiteflying career. Some of those original kitefliers I met at the 1982 AKA Convention are still showing up, they are some of who I call the Long Timers. While others only have a very short life span! Many of you have seen those short time fliers I’m referring to! Just like a May Fly one person or another arrives at a kite field and is bubbling with enthusiasm. They have thousands of questions! And they decide that every kite that they see in the air just has to be in their kite bag! They end up maxing out their credit cards at the local kite shop. They are at every kite festival, and want to participate in every type of kiteflying imaginable! They volunteer for everything, and it seems if their entire existence revolves around kiteflying. In the process of researching some of my articles and writing I get to see many fliers names especially on those Sport Kite Competition flight orders for the National Convention. I see when someone becomes a Novice and I see when they Move up to a higher class! I also see when they are no longer around. I noticed over the years that the Life Expectancy for about 50% of sport kite fliers is around Five Years The entire process from Novice to Gone sometimes happens in that short a time span. Now there are some fliers that last 6 – 8 -10 years and some “long Timers” like myself, Vern Balodis, Eric Wolff and others who are still around after 20 – 25 years. Why is that I wonder? What exactly keeps some people coming back year after year when others go missing after 3 or 4 years? In the mid 90’s I began a Personal Project to try and find out exactly what turned some fliers into Long Timers and others into Goners… To tell the truth I planned to write an article about it all, never did, but here’s basically what I learned. I tracked three separate groups of fliers over a period of five years in the Midwest! First group were three single guys, between 20 – 30 years old. Second group were two guys and two girls (all married, but spouses were not kitefliers) Third group were three single girls ages 25 – 30. Of course none of these fliers knew that they were Al’s Test Subjects and as you’ll note I will mention no names as some are still around the fields today! Between 1993 and 1998 I watched all ten of these fliers enter the “SK Competition World” become Novice fliers and progress through many competition events. They all became really addicted in one form or another and all bought lots of kites! They traveled to events far and near and “contested” in the Midwest AKA Conferences to receive “invites” to the AKA Nationals. All these fliers knew each other and They all usually won those Nationals invites. There was a common and friendly rivalry between them all! By 1998-99 six of these ten fliers no longer showed up at any events. One flier occasionally visits fun flies at local festivals, but no longer even considers competitions. I had hoped for some solid data from my little experiment, but unfortunately people and their attitudes are very hard to quantify. But here’s a list of the things fliers that aren’t around anymore talked about quite a lot! I really hope I win this event! I know I’m better then all the rest of those fliers! Why do we have to share the field with those fighter kite guys? I got robbed at that event! People around this event are such jerks! I only like stunt kite flying! Single line kites are so boring! You meet the nicest people at a kite festival! I don’t know that but I’d like to learn! I don’t care if I win or lose, as long as I do my best! Did you see those cool kites in the single line side of the field! That’s really interesting… Will you teach me how to do that? You meet the nicest people on the kite fields! So I’ll leave it to all of you to decide what keeps fliers coming back year after year! AND why some kitefliers have a short Life Span? This entry was posted in 2005, Issue 40 (Jan/Feb), Kite Columns, KL Archive, Tangents and Trivia and tagged experience, people, sport.